Cal Lutheran junior Sarah Ceralde works with a student at MATES. (THOUSAND OAKS, Calif. – Feb. 8, 2019) California Lutheran University and Meadows Arts and Technology Elementary School (MATES) have formed a unique partnership to provide undergraduates with more fieldwork opportunities and the public charter school staff and students with additional support and resources. This Community Collaboration School Partnership is the first of its kind for the university’s undergraduate students and possibly the first in California. Students enrolled in credential programs through Cal Lutheran’s Graduate School of Education regularly gain classroom experience through similar agreements with other schools. 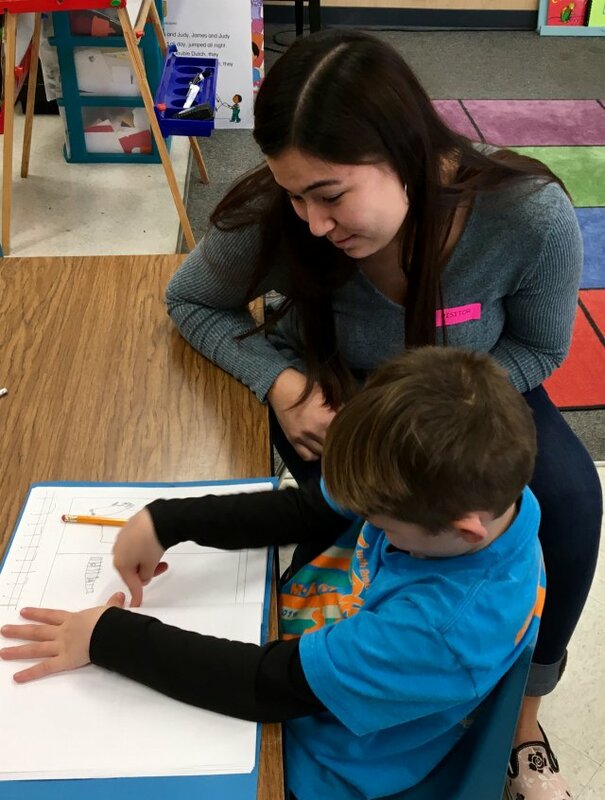 Similar to the relationship between teaching hospitals and medical schools, the partnership gives students majoring in interdisciplinary educational studies experience while providing the kindergarten-through-fifth-grade school with support. The agreement will make it easier for Cal Lutheran students to fulfill their degree requirement to spend at least 200 hours working with experienced teachers in classrooms and applying the theories they are learning. Field study is a cornerstone of the Interdisciplinary Educational Studies Program. Planning careers as elementary school teachers, most students will enter credential programs after they graduate. The partnership also allows Cal Lutheran faculty to work with MATES teachers and students and share the latest research-based teaching techniques. University faculty benefit from staying connected with elementary classrooms. The faculty and students at both schools all learn from one another. “It’s a mutually beneficial partnership that gives undergraduate students the opportunity to gain real-world experience and benefits our students and teachers by providing additional support and adult attention in the classroom,” said MATES Executive Director Brenda Olshever. Cal Lutheran has worked informally with the Thousand Oaks school for five years, sending up to 40 interdisciplinary educational studiesstudents a year into its classrooms, before this agreement strengthened and expanded the partnership. In spring 2018, Cal Lutheran students gave an overview of opera before a performance at MATES and developed lesson plans for teachers to delve deeper into the subject.